For weeks we have been watching our first tomatoes grow larger and larger without turning red. More than once I teased SO about my temptation to pick a few and fry them up. This morning we discovered last night’s wind storms blew over our EarthBox! Thank heaven, the two large plants are fine. Some of the fruit got torn off the vines but, again, we are blessed. No insects got into them during the night. And we have plenty more still attached. 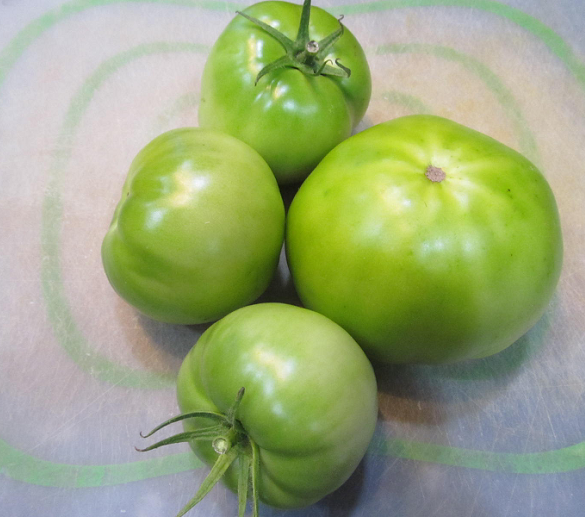 Guess who’s cooking fried green tomatoes today? I want to hear how they taste. I saw the movie but have never eaten fried green tomatoes. Wind blew over one of my sunflowers yesterday. I usually tie them up loosely with strips of cloth about this time when they get a certain height but had not done so yet. Oh, no! I hope you can rescue the plant. I'm eating as I type. The crunch of cornmeal and bread crumb batter paired with the softer tart taste of a homegrown tomato is out of this world. Interestingly, I loved them as a child but my recipe came from the Internet. Heh... I guess my parents weren't fond of them and my maternal grandma took her secret to the grave. ~sigh~ These are probably the closest I could come to making hers, at least. Be well! Yum! Enjoy :) Glad your plant survived. Thanks! Me, too. Be well! I was going to ask about fried green tomatoes. You'll have to tell us how it turned out. They're delicious! Four tomatoes made a lot and they are still good, even cold. Be well! Oh no. I hope fried green tomatoes are as good as they sound. I've never tried them. I'm waiting for my tomatoes to turn red. Given my lack of gardening skill, I'm amazed I have any - red or green! They are. I don't know why none of ours are turning red. We struggle with gardening, too. Best wishes on yours. Be well! Well look at you....I got three tomatoes off one plant. They were there when I bought it and it seemed they would never turn. I moved them to the center of the yard (in pots) and they turned. But so far no more. The other plant has not even gotten one of it. I feel so cheated! Been a long time since I had a good fried green mater...yum, sounds good. Bet it was. I'm sorry you're not seeing lots of tomatoes. We have one plant in the garden patch not looking good. I added Epsom Salts to the soil. We shall see. Be well! Let's all remember, it's only the beginning of July! I think we are all trying to hurry those red tomatoes! I am getting the miniature Ditmarsher tomatoes already. It's a tiny plant in a container, but the tomatoes are cherry sized, not itsy bitsy. I've never cooked the green ones. So true! Happy Gardening, my dear.